North-West e-learning mentor projects : It's Roadshow Season! Please join us. Friday 28 June. It's Roadshow Season! Please join us. Friday 28 June. 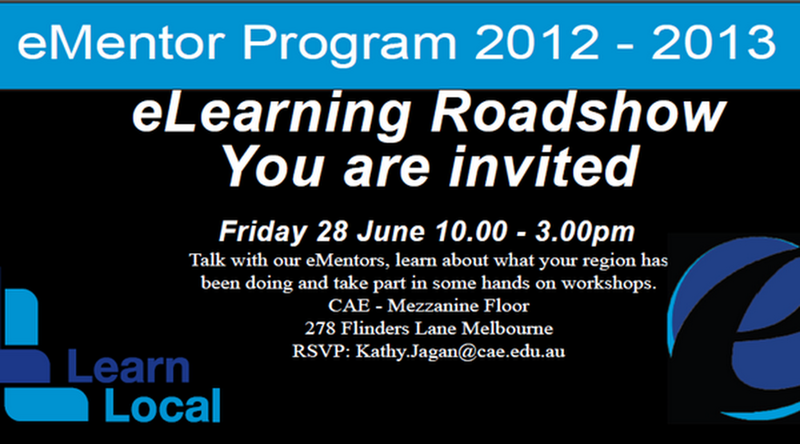 If you haven't noticed already, there's an e-learning Roadshow coming to you very soon. In Melbourne's metropolitan region, we're setting up the show on Friday 28 June, the last day of term 2.. at the CAE in the heart of the city's coffee-scented Degraves street haven. Don't miss out.. book now for this terrific opportunity to network with your colleagues, share your stories and find out what e-learning educators have been up to all around the state of Victoria. There will also be regional roadshow days, for example Mooroopna on Wednesday 17 July. And yes we are coming to the end of this 12 month e-learning mentor project.. but never fear, you will be able to re-apply for the next 6 months, for more individual support from your local mentors.